My husband doesn't like vegetables. In fact, he says he's a "meat-a-tarian". His definition of meat-a-tarian = everything he eats, has already eaten vegetables, so he has in fact, eaten vegetables. I know, he's crazy, that's one of the many reasons I love him. 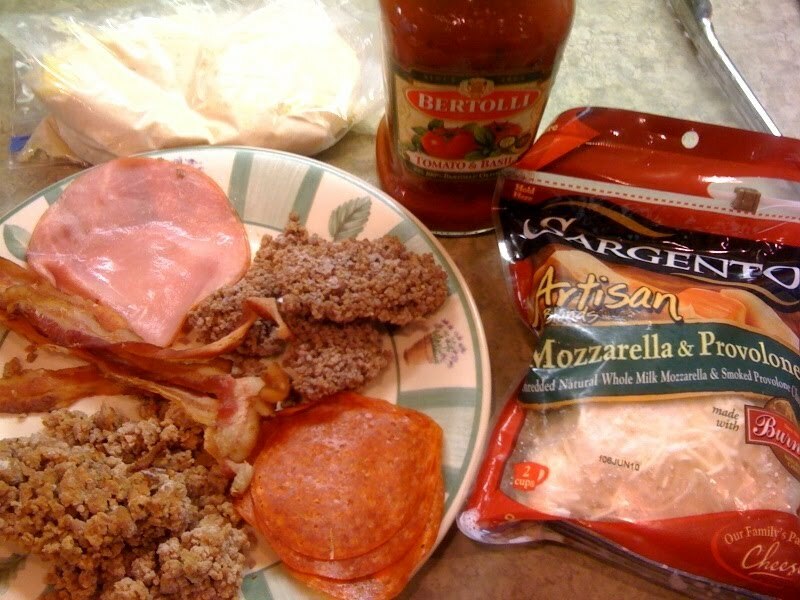 We haven't had a traditional pizza in a while, so I thought I'd make one similar to our favorite "meat lovers" pizza at Nicolo's Chicago Style Pizza in Duluth. Prepare pizza according to directions. Spread sauce to within 1" of edge of dough. Layer ham slices and pepperoni slices over sauce. 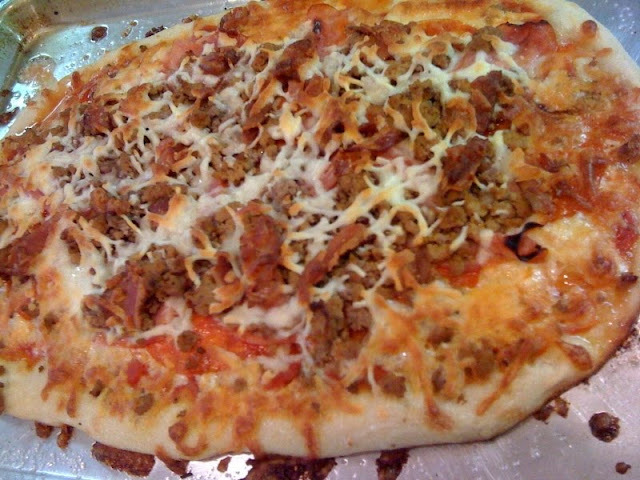 Sprinkle ground beef, sausage and chopped bacon evenly over the previous layers. Top with cheese and bake per dough directions. Oh my word y'all! This one will make you slap your momma it's so good! I ate 2 pieces, the kids shared a slice and my hubby? Yeah, he ate the rest! He said it was the best pizza he's had in a long time. Definitely a keeper. This one will make any "Meat Eater" happy! By the way, the mozzarella cheese, ground beef, Italian turkey sausage, bacon and ham slices were in the freezer waiting for me. And I picked up some of the deli pepperoni at Publix last week. I didn't bother thawing out the meats from the freezer since the oven is set on 500 degrees and the pizza bakes for 10-12 minutes. 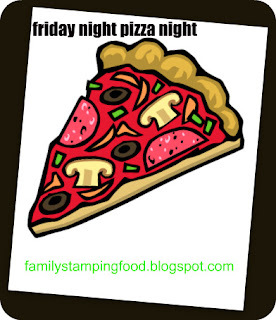 Have a great Pizza Night and enjoy your weekend! I will definitely be making this one. My husband will be happy! tasty! i just jumped on to get a pizza idea and knew you'd have a few good ones. i'm glad to hear that the meat did just fine, going on frozen. yay!! Thank you so much. I will try it again this weekend! My husband seconds that emotion! !